I arrived in Hong Kong end of February 2007, with very few possessions, an empty bank account and a mix of excitement and insecurities about my future. As a student, I had dreamed of living and making it in Asia, before putting my Asian ambitions on hold for a stab at entrepreneurial glory in my native Germany. Now less than two years later I stood in the arrival hall at Hong Kong Chek Lap Kok Airport with a suitcase at the weight limited and a hand-carry backpack that I could barely lift. After two exhausting and intense years as an entrepreneur, trying to establish an online retailer for video games in Germany, my investors/business partners and me had mutual agreed to close down. We wrapped-up our German venture, and I relocated to Hong Kong, taking a leading role in their booming business. There was no working contract, no work visa yet, just a verbal agreement that I would receive a monthly salary of HK$ 20,000 + accommodation and my job title would be General Manager. A lot of questions regarding my position and the life in Hong Kong were left open. Busy closing down my two businesses in Germany, selling off a small warehouse full of video games and getting rid of my apartment and its’ interior, I had not much time to worry. When I finally boarded the plane to Hong Kong, I was pretty a leap in the dark. My friend, ex-investor and future boss picked me up; I would spend the first nights on his guest couch while looking for a suitable apartment. He lived on Ma Wan, a small island between Lantau and Tsing Yi. Formerly hosting just a fishing village, Ma Wan got developed in the early 2000th after the Tsing Ma bridge connecting urban Hong Kong to the newly relocated airport and Disneyland on Lantau. Ma Wan’s Park Island Estate was a byproduct of this development and surely also contributed significantly in financing the development cost. While being technically an island, Ma Wan is connected with a ramp to the Tsing Ma Bridge and runs shuttle buses to several parts of the city. My new life in Hong Kong literally started under a bridge. Keen to start my new position on March first, I did not waste any time and started looking for an apartment on Ma Wan right away and rented a fully furnished 700 sqft apartment just three days later. I learned two things about Hong Kong right away: apartments are much smaller in reality than they are on paper and real estate transactions in Hong Kong are like trading stocks in other countries. In many ways apartments are commoditized, even room sizes are often the same in different residential estates. Renting a furnished place, I only needed to buy basic household items and a TV, for which I had to ask my bosses for an advance to my first salary. Having the basics set, I went to the office on March 1st, 2007. Before officially taking up my position, I first had to draft my worn work contract and fill in the visa application, which was granted in early May. While having been working part-time as a student all the time, my first job in Hong Kong was technically my first ever full-time employment. I was 29 years old and suddenly responsible for more than 20 people staff. Getting the General Manager position in Hong Kong obviously was related to my work with the owners of the company in the years prior, they knew what I was capable of, and they trusted me. Nevertheless, I think it is fair to say that a jump like this, from University into the management of a medium sized company, would have been much harder in Europe. Post-Colonial Mindset or the "Gweilo Bonus"
Getting into management responsibilities at a relatively young age brings along some challenges. One of the bigger ones is to get the respect of a workforce either close in age or older than yourself. While I learned some painful lessons, and had to make some adjustments to my leadership style (I wrote about this previously) and, the fact that I was a “Gweilo,” a foreigner, helped most definitely. My theory is that partly as residue from Hong Kong’s colonial past, and partly due to shyness to argue in English (Caucasian) foreigners enjoy a certain respect bonus. While I consciously try to avoid making use of this privilege, it surely helped to raise my managerial profile at the beginning and compensated somewhat for my youth and lack of experience. I feel that owe some gratitude to Hong Kong, for giving me the chance to proof myself at a relatively young age. Hong Kong in one Word? Efficiency! There is a lot to love about Hong Kong, but efficiency is clearly its’ superpower. I have a limited sample size when it comes to contact with the public administration. But compared to the other countries I experienced firsthand (Germany, Japan, Malaysia, US), Hong Kong is on a completely different level. A transparent visa process, the opportunity to make online appointments for administrative acts, a tax declaration that never takes longer than 20 minutes; even getting married was a pleasant and smooth process. If I ever leave Hong Kong, I am 100% sure that I will miss the incredible efficiency of the SAR’s administration. And Hong Kong’s efficiency does not stop at the public administration. Hong Kong is a tiny blip on the world map but offers almost everything within its borders: shopping outlets featuring almost every known brand, authentic restaurants for almost every palate, beaches and diving grounds, mountains, and hundreds of kilometers hiking trails. There are not many cities worldwide that offer such variety close to the urban center. From almost every spot in the city, you can reach a hiking path in a matter of minutes. The Hong Kong’s most obvious downside is its population density. Hong Kong’s population squeezes into the small stripes between the sea and the rocks, into giant apartment blocks portioned into tiny units, each selling for the price of an entire European village. Malls on weekends are notoriously cramped, restaurants need either a reservation or waiting in line, and attractions like the annual Hong Kong Wine & Dine Festival are almost always operating at their capacity limit. That you barely ever hear about amok runs or larger scuffles speaks for the Hong Kong people. Hongkongers wait patiently, they queue up with enormous discipline and treat their fellow human being with willful ignorance. I guess when you are socialized in a 450 square feet apartment housing 7 or more people of three generations, this is the only way to operate. While with increasing age my yearning for more living space and the dream of a house with a garden intensified, I still would prefer Hong Kong over any other Metropolis in case the Zombie Apocalypse ever hits. I cannot deny it, over the past ten years I have changed a lot; and so did Hong Kong. I lost quite a bit of hair, got fatter, but also quite a bit wiser. I like to think that I managed to reinvent myself a few times, first as manager and now as a blogger and a husband. Hong Kong also “fattened” significantly, the population grew from 6.9 million to more than 7.3 million people and with this swell in population rents rose and the process of gentrification intensified. Different from me, it seems as if Hong Kong is still looking for its identity. With Hong Kong’s role as the bridgehead in the China trade slowly fading and its role as regional finance center threatened by Shanghai, the Hong Kong Special Administrative Region is in danger to become just another Chinese city. 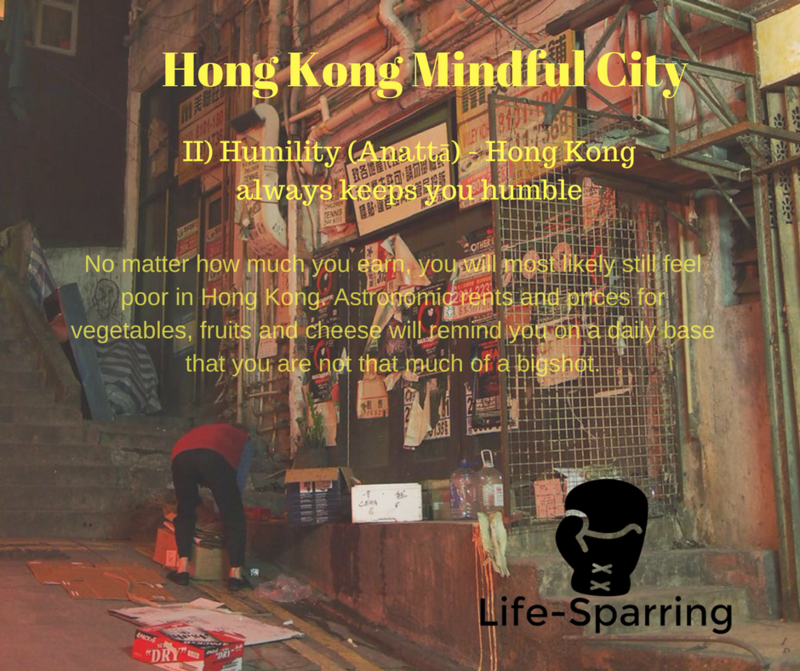 The effects of the gentrification and the lack of a vision for the city are also what fuels the localist movement and what drove people to the street during the “Umbrella Movement.” If you are a university graduate in Hong Kong, what is your perspective in a city, where even the tiniest apartment will cost more rent than your entry salary? It is not a surprise that the mood of the Hong Kongese clouded severely over the past years and four out of ten citizens consider to leave the city. Maybe the hope for upward mobility was always more an illusion than a real chance, but it created a positive busyness that made Hong Kong special. Nowhere could you find such a big income disparity combined with almost no envy. The mood in Hong Kong definitely changed over the past ten years. If there is no chance, the pessimism will likely intensify and further fuel both resignation and rebellious "localism". I honestly cannot answer, if there will be another ten years of Hong Kong for me. I have no immediate plans to leave the city, I enjoy my current life, even my current job, but the desire to own a real home, maybe even with some green around it is growing steadily. Hong Kong has a lot of advantages, and its tax system is beneficial for somebody accumulating wealth, but maybe I am just getting too old for the hustle and bustle of the city? If I ever leave Hong Kong, I will surely take a piece of the city with me and leave a part of me here. Hong Kong made me whom I am today, for that I am grateful. Unfortunately, I can’t return the favor easily. I can only wish the best for Hong Kong, the “Falling City” with whom I am still in love. Let’s just hope Hong Kong successfully reinvents itself soon.